During a regular demo outside Barclays (due to their support for Huntingdon Life Sciences) a group of teenagers came to find out what the demo was about. 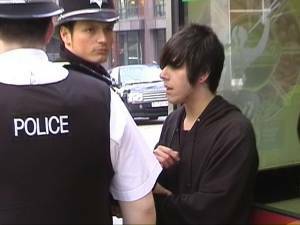 The police were called, they arrested one teenager (Video) for alleged criminal damage (kicking the door of Barclays) which activists claim he didn’t do, then refused to take details of bystanders who were witnesses to the non-crime. See update on arrested person and the SHAC topic page for information on the ongoing campaign. SHAC Brum reported: "Soon to show up were the police who once again insisted we could not use the megaphone, contrary to our last demo when we were visited by a Duty Inspector who told us we could. After spurring several “ideas” of theirs to why we could not use the megaphone, including “this week is a different week to last week” and “there is a different duty officer working today” – clearly they believe they can make up the law as they go along. Their next idea was to say we couldn’t use it due to section 5, more lies. As we refused to stop using the megaphone, stating we were in our legal rights to use one on the demonstration – they then decided to threaten us with arrest and confiscation of the megaphone. However when questioned in more detail about the section in relation to what they were saying they, literally, went on their bikes."